Download "Department of History Policy 1.1. Faculty Evaluation. Evaluation Procedures"
1 Approved: 2/23/099 Department of History Policy 1.1 Faculty Evaluation Evaluation Procedures 1. 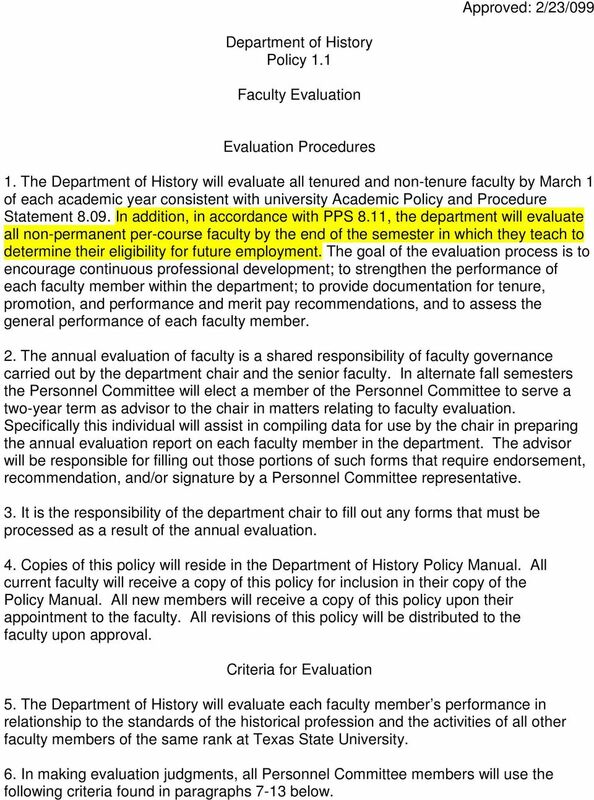 The Department of History will evaluate all tenured and non-tenure faculty by March 1 of each academic year consistent with university Academic Policy and Procedure Statement In addition, in accordance with PPS 8.11, the department will evaluate all non-permanent per-course faculty by the end of the semester in which they teach to determine their eligibility for future employment. The goal of the evaluation process is to encourage continuous professional development; to strengthen the performance of each faculty member within the department; to provide documentation for tenure, promotion, and performance and merit pay recommendations, and to assess the general performance of each faculty member. 2. The annual evaluation of faculty is a shared responsibility of faculty governance carried out by the department chair and the senior faculty. 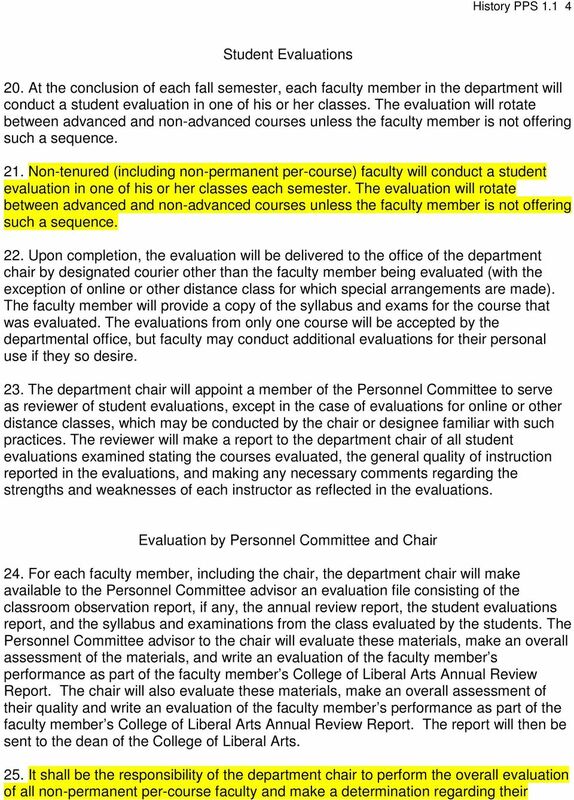 In alternate fall semesters the Personnel Committee will elect a member of the Personnel Committee to serve a two-year term as advisor to the chair in matters relating to faculty evaluation. Specifically this individual will assist in compiling data for use by the chair in preparing the annual evaluation report on each faculty member in the department. The advisor will be responsible for filling out those portions of such forms that require endorsement, recommendation, and/or signature by a Personnel Committee representative. 3. It is the responsibility of the department chair to fill out any forms that must be processed as a result of the annual evaluation. 4. Copies of this policy will reside in the Department of History Policy Manual. All current faculty will receive a copy of this policy for inclusion in their copy of the Policy Manual. All new members will receive a copy of this policy upon their appointment to the faculty. All revisions of this policy will be distributed to the faculty upon approval. Criteria for Evaluation 5. The Department of History will evaluate each faculty member s performance in relationship to the standards of the historical profession and the activities of all other faculty members of the same rank at Texas State University. 6. In making evaluation judgments, all Personnel Committee members will use the following criteria found in paragraphs 7-13 below. 2 History PPS Teaching 7. The positive characteristics of a good university teacher are understood to be: a. Competent in the discipline of History b. Articulate in communicating factual data and concepts of the discipline to others c. Responsible in the performance of academic duties (i.e. meets classes, grades exams, submits required reports, etc.) d. Scrupulous in maintaining high academic standards e. Exhibits interest in and maintains rapport with students inside and outside of the classroom f. Awards grades compatible with historical departmental patterns 8. A faculty member will meet departmental expectations if his or her teaching conforms to the characteristics described above. Research and Professional Activity 9. Historical research includes investigation of primary and/or secondary source materials undertaken for the purpose of presenting outside the classroom or publishing an original or general historical analysis for specialists, students, or the general public. 10. Professional activity shall be understood to include those ancillary aspects of scholarly activity such as reviewing manuscripts for publishers, publishing book reviews, serving on panels at scholarly conferences, serving as an officer or committee member of professional and scholarly associations. 11. A faculty member shall meet departmental expectations if she or he is meaningfully engaged in some or all of these activities. Service 12. Service shall be understood to mean activities inside or outside of the University that constitute a bona fide effort to advance the discipline of history, the department, the university, the profession, or the community. 3 History PPS A faculty member shall meet departmental expectations if she or he undertakes some or all of the service activities as described above. Overall Evaluation of Performance 14. The department considers all three areas of activity to be essential components of its tenure-track and tenured faculty's professional obligations. For lecturers and clinical faculty teaching and service are the essential components of professional activity. The precise balance of these three types of activity will vary for each faculty member since institutional and professional obligations of the individual necessarily vary from year to year and depend on employment status. Materials and Procedures for Evaluation Self Evaluation 15. During the month of January, each member of the department excluding teaching assistants and non-permanent per-course faculty will file a summary of their professional activities for the preceding calendar year using the College of Liberal Arts Annual Review Report. Classroom Evaluation of Non-Tenured Faculty 16. By October 1 and February 1 of each academic semester, the chair will assign individual Personnel Committee members to visit one class of each non-tenured (including non-permanent per-course) faculty member. 17. Tenure-track faculty will be visited twice each year. Permanent non-tenured faculty will be visited twice a year through the third year of service, after which they will be visited only as often as is deemed necessary by the department chair and Personnel Committee. Non-permanent per-course faculty will be visited each semester they are hired to teach. 18. After class visitations have been made, the evaluator will submit a written report to the chair through the Personnel Committee advisor to the chair appraising the faculty member's performance and expertise. This report will specifically cite any problems that would warrant additional visits during the current semester. 19. Tenure-track faculty and the classroom evaluator will then meet, as described in the History Department Tenure and Promotion Policy, with the chair to evaluate the faculty member s overall progress toward achieving tenure. 5 History PPS eligibility for future employment. Such evaluation shall consist of, but not be limited to, a review of the student evaluations, classroom visitation report, syllabi and other course material, and the Personnel Committee advisor s report. A statement of the results of the evaluation and determination of eligibility for future employment shall then be placed in the instructor s personnel file. 26. If the Personnel Committee advisor and the chair believe that a particular faculty member s professional activities, especially in the area of teaching, require improvement, the chair will undertake the necessary consultations with the affected faculty member. If, in the opinion of the chair, the deficiencies are minor in character and improvement can be easily achieved, no permanent record of these consultations will be included in the written report placed in the faculty member s file. 27. In cases where a faculty member may marginally meet departmental expectations but where serious or repeated problems continue to exist in one or more areas of performance, the chair may create a special committee to examine a faculty member's performance and to recommend steps to remedy whatever problems may exist with the principal emphasis being on the proper remediation of the faculty member. 28. 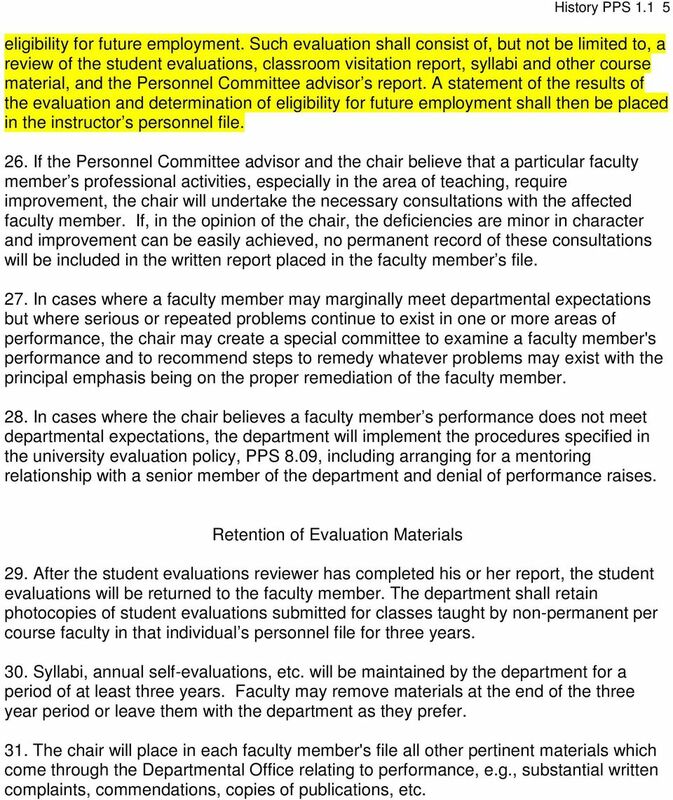 In cases where the chair believes a faculty member s performance does not meet departmental expectations, the department will implement the procedures specified in the university evaluation policy, PPS 8.09, including arranging for a mentoring relationship with a senior member of the department and denial of performance raises. Retention of Evaluation Materials 29. After the student evaluations reviewer has completed his or her report, the student evaluations will be returned to the faculty member. The department shall retain photocopies of student evaluations submitted for classes taught by non-permanent per course faculty in that individual s personnel file for three years. 30. Syllabi, annual self-evaluations, etc. will be maintained by the department for a period of at least three years. 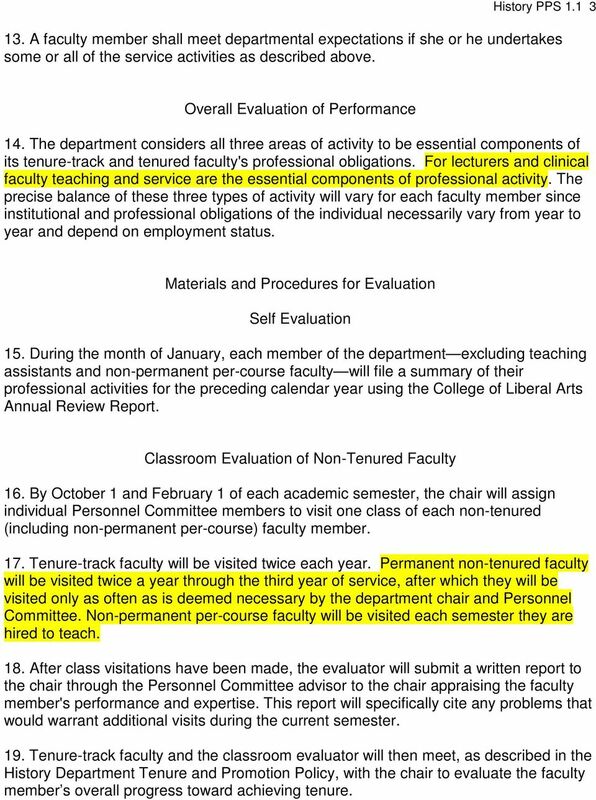 Faculty may remove materials at the end of the three year period or leave them with the department as they prefer. 31. The chair will place in each faculty member's file all other pertinent materials which come through the Departmental Office relating to performance, e.g., substantial written complaints, commendations, copies of publications, etc. 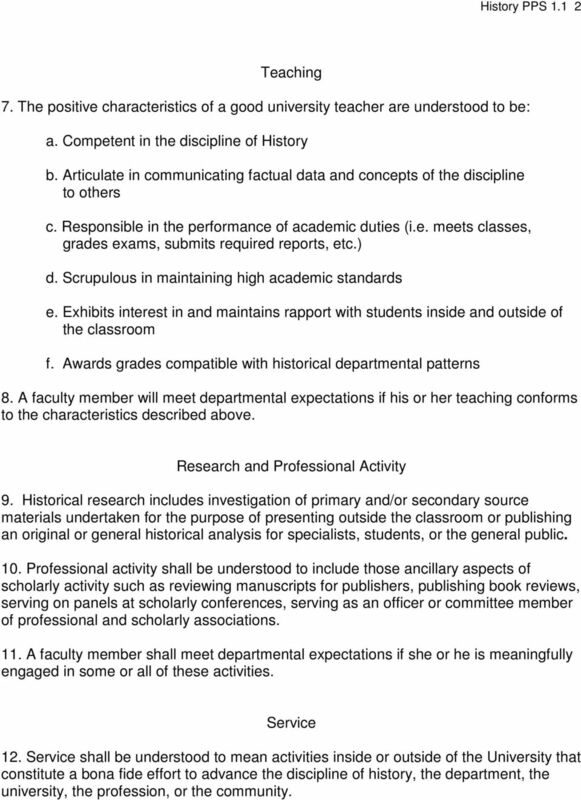 6 Approved: 2/23/2009 Department of History Policy 1.3 Faculty Workload Policy 1. 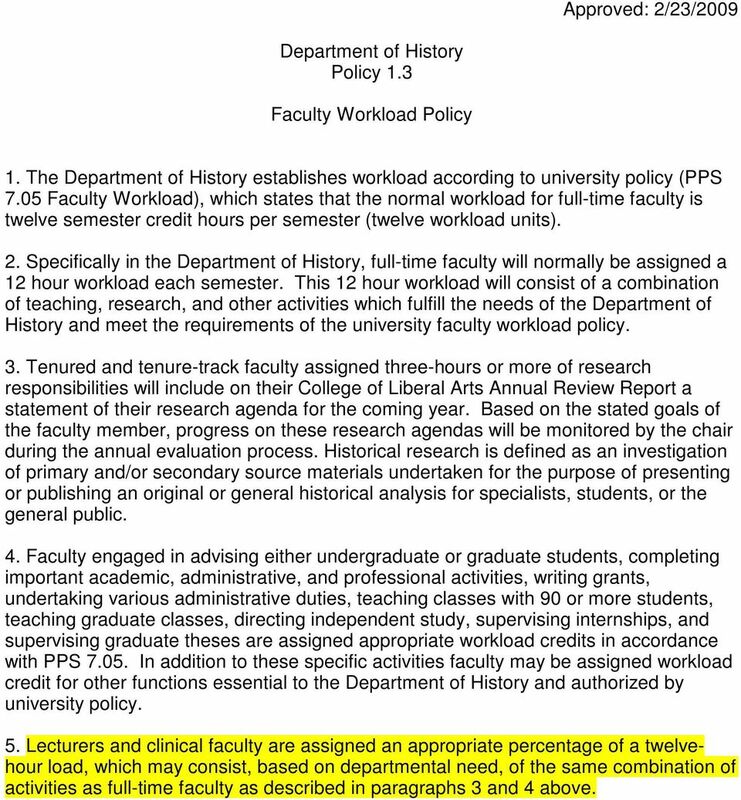 The Department of History establishes workload according to university policy (PPS 7.05 Faculty Workload), which states that the normal workload for full-time faculty is twelve semester credit hours per semester (twelve workload units). 2. Specifically in the Department of History, full-time faculty will normally be assigned a 12 hour workload each semester. This 12 hour workload will consist of a combination of teaching, research, and other activities which fulfill the needs of the Department of History and meet the requirements of the university faculty workload policy. 3. Tenured and tenure-track faculty assigned three-hours or more of research responsibilities will include on their College of Liberal Arts Annual Review Report a statement of their research agenda for the coming year. Based on the stated goals of the faculty member, progress on these research agendas will be monitored by the chair during the annual evaluation process. Historical research is defined as an investigation of primary and/or secondary source materials undertaken for the purpose of presenting or publishing an original or general historical analysis for specialists, students, or the general public. 4. Faculty engaged in advising either undergraduate or graduate students, completing important academic, administrative, and professional activities, writing grants, undertaking various administrative duties, teaching classes with 90 or more students, teaching graduate classes, directing independent study, supervising internships, and supervising graduate theses are assigned appropriate workload credits in accordance with PPS In addition to these specific activities faculty may be assigned workload credit for other functions essential to the Department of History and authorized by university policy. 5. 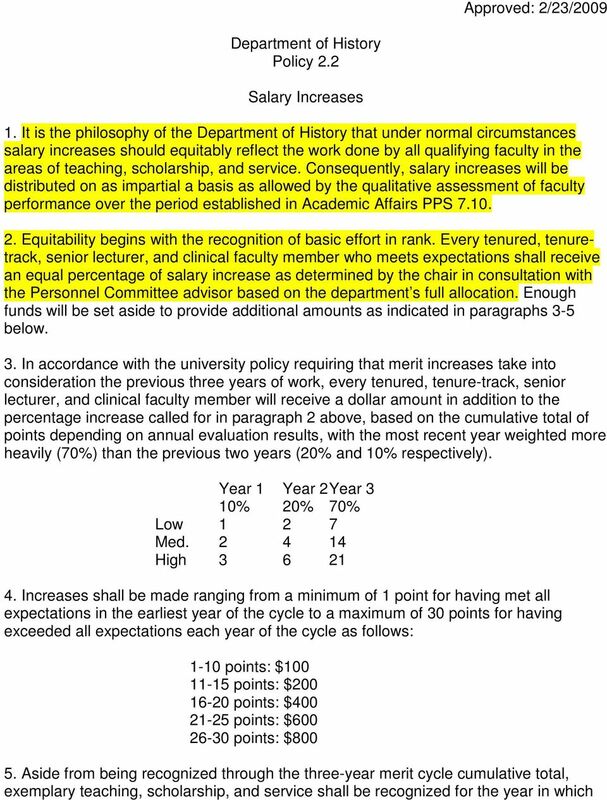 Lecturers and clinical faculty are assigned an appropriate percentage of a twelvehour load, which may consist, based on departmental need, of the same combination of activities as full-time faculty as described in paragraphs 3 and 4 above. 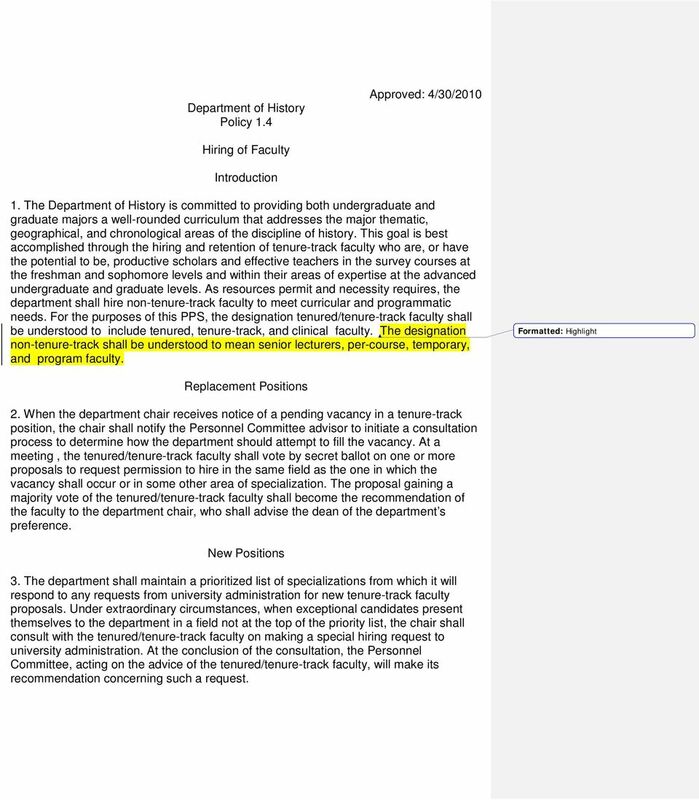 7 Department of History Policy 1.4 Approved: 4/30/2010 Hiring of Faculty Introduction 1. The Department of History is committed to providing both undergraduate and graduate majors a well-rounded curriculum that addresses the major thematic, geographical, and chronological areas of the discipline of history. This goal is best accomplished through the hiring and retention of tenure-track faculty who are, or have the potential to be, productive scholars and effective teachers in the survey courses at the freshman and sophomore levels and within their areas of expertise at the advanced undergraduate and graduate levels. As resources permit and necessity requires, the department shall hire non-tenure-track faculty to meet curricular and programmatic needs. For the purposes of this PPS, the designation tenured/tenure-track faculty shall be understood to include tenured, tenure-track, and clinical faculty. The designation non-tenure-track shall be understood to mean senior lecturers, per-course, temporary, and program faculty. Formatted: Highlight Replacement Positions 2. When the department chair receives notice of a pending vacancy in a tenure-track position, the chair shall notify the Personnel Committee advisor to initiate a consultation process to determine how the department should attempt to fill the vacancy. 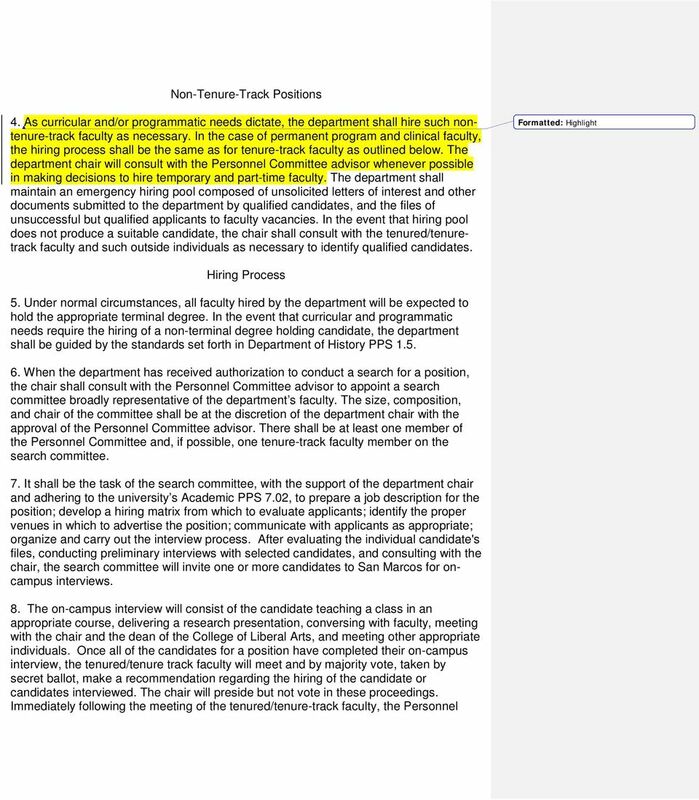 At a meeting, the tenured/tenure-track faculty shall vote by secret ballot on one or more proposals to request permission to hire in the same field as the one in which the vacancy shall occur or in some other area of specialization. The proposal gaining a majority vote of the tenured/tenure-track faculty shall become the recommendation of the faculty to the department chair, who shall advise the dean of the department s preference. New Positions 3. The department shall maintain a prioritized list of specializations from which it will respond to any requests from university administration for new tenure-track faculty proposals. Under extraordinary circumstances, when exceptional candidates present themselves to the department in a field not at the top of the priority list, the chair shall consult with the tenured/tenure-track faculty on making a special hiring request to university administration. 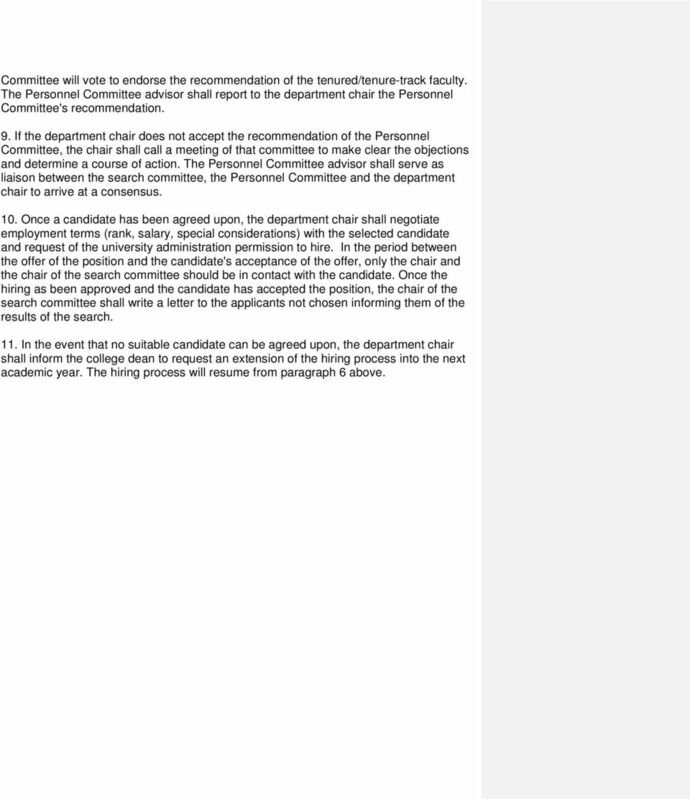 At the conclusion of the consultation, the Personnel Committee, acting on the advice of the tenured/tenure-track faculty, will make its recommendation concerning such a request. 9 Committee will vote to endorse the recommendation of the tenured/tenure-track faculty. The Personnel Committee advisor shall report to the department chair the Personnel Committee's recommendation. 9. If the department chair does not accept the recommendation of the Personnel Committee, the chair shall call a meeting of that committee to make clear the objections and determine a course of action. The Personnel Committee advisor shall serve as liaison between the search committee, the Personnel Committee and the department chair to arrive at a consensus. 10. Once a candidate has been agreed upon, the department chair shall negotiate employment terms (rank, salary, special considerations) with the selected candidate and request of the university administration permission to hire. In the period between the offer of the position and the candidate's acceptance of the offer, only the chair and the chair of the search committee should be in contact with the candidate. Once the hiring as been approved and the candidate has accepted the position, the chair of the search committee shall write a letter to the applicants not chosen informing them of the results of the search. 11. In the event that no suitable candidate can be agreed upon, the department chair shall inform the college dean to request an extension of the hiring process into the next academic year. The hiring process will resume from paragraph 6 above. 10 Approved: 8/21/2007 Department of History Policy 1.6 Summer Teaching 1. The Department of History recognizes that its primary obligation regarding summer teaching is to meet the educational and programmatic needs of survey, advanced, and graduate students during the summer sessions and to advise new students planning to enter the university the following fall semester. 2. This obligation requires that sections of the U.S. survey, western or world civilization, advanced courses, and graduate seminars be offered each summer session. Graduate and undergraduate advising should be available throughout the summer. The department chair is responsible for scheduling the courses and recruiting the faculty that will meet these needs. 3. In the event of budget restrictions that constrain the department s ability to meet fully these departmental obligations: a. The highest priority shall be to meet the needs of History majors and minors needing advanced courses to complete their degrees and to provide proper academic advising to new students. To meet the needs of advanced students a selection of courses from all course groupings should be offered each summer session; b. 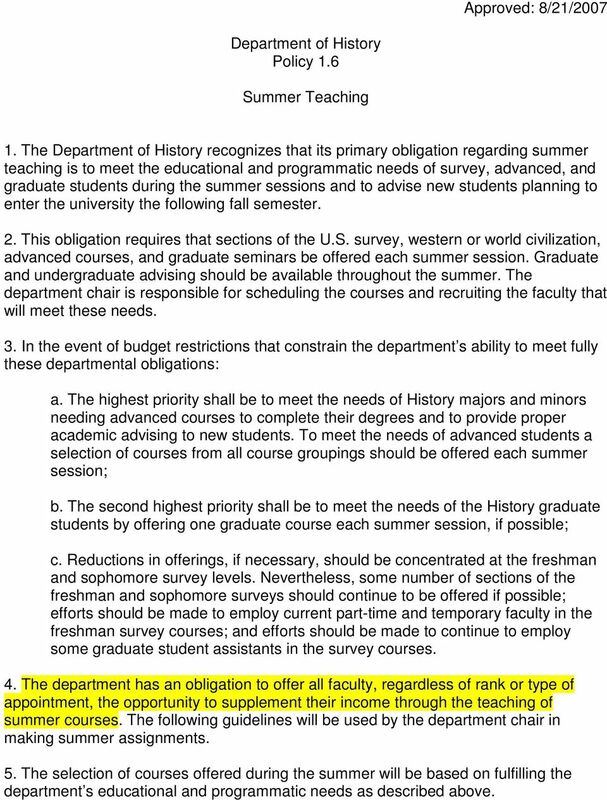 The second highest priority shall be to meet the needs of the History graduate students by offering one graduate course each summer session, if possible; c. Reductions in offerings, if necessary, should be concentrated at the freshman and sophomore survey levels. Nevertheless, some number of sections of the freshman and sophomore surveys should continue to be offered if possible; efforts should be made to employ current part-time and temporary faculty in the freshman survey courses; and efforts should be made to continue to employ some graduate student assistants in the survey courses. 4. The department has an obligation to offer all faculty, regardless of rank or type of appointment, the opportunity to supplement their income through the teaching of summer courses. The following guidelines will be used by the department chair in making summer assignments. 5. The selection of courses offered during the summer will be based on fulfilling the department s educational and programmatic needs as described above. 11 History PPS As far as possible, all summer assignments will be made on an equitable basis. If possible, all faculty requesting summer teaching will be assigned two classes or the equivalent for one summer session. 7. If financial restrictions prevent the department chair from fulfilling all requests for summer assignments, the following priority system, subject to modification to meet curricular requirements, will be implemented. a. All faculty who have submitted requests for full or phased retirement effective 31 August of the academic year in question will be placed in the highest priority group to receive full teaching duties or the equivalent for one summer session. b. All faculty who have not taught the previous summer will be placed in the second highest priority group to receive full teaching duties or the equivalent for one summer session. c. All faculty who taught two courses the previous summer will be placed in the lowest priority group for summer assignments. d. In certain circumstances, the chair may offer a faculty member the opportunity to teach a single course during a summer session..faculty teaching a course in this circumstance would be placed in the same priority category as faculty who had received no teaching assignment for that summer. e. Faculty receiving a summer salary grant of at least $4,000 as part of university Research Enhancement Grant or any other grant shall not normally be eligible for a summer teaching assignment, but they shall be placed in the same priority category as faculty who have received no teaching assignment for that summer. 8. Retired faculty will not normally be eligible for summer teaching assignments. 9. 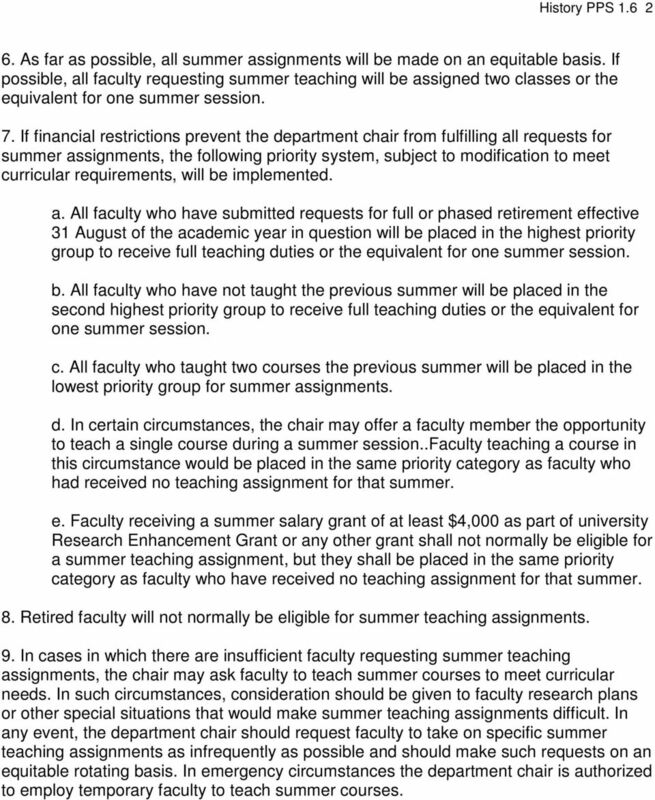 In cases in which there are insufficient faculty requesting summer teaching assignments, the chair may ask faculty to teach summer courses to meet curricular needs. In such circumstances, consideration should be given to faculty research plans or other special situations that would make summer teaching assignments difficult. In any event, the department chair should request faculty to take on specific summer teaching assignments as infrequently as possible and should make such requests on an equitable rotating basis. In emergency circumstances the department chair is authorized to employ temporary faculty to teach summer courses. 12 Department of History Policy 1.8 Faculty Conversions Approved: 4/30/2010 PURPOSE 1. 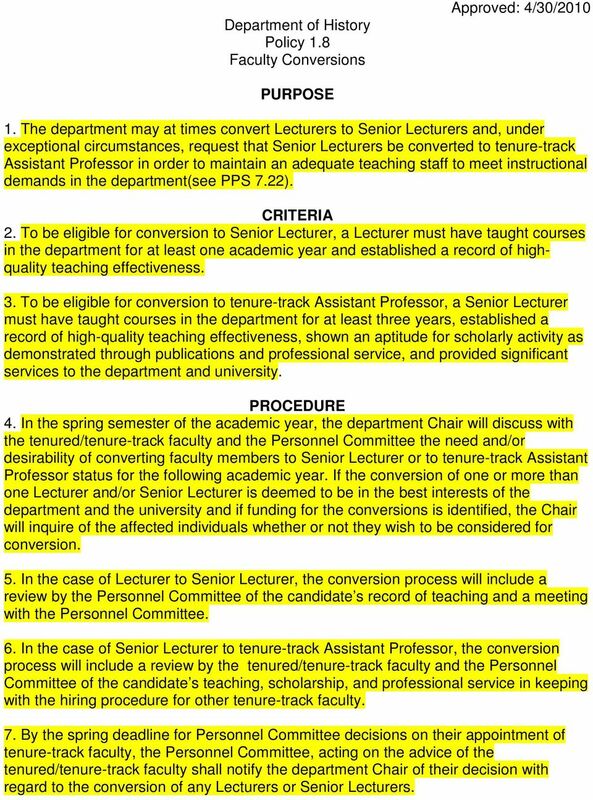 The department may at times convert Lecturers to Senior Lecturers and, under exceptional circumstances, request that Senior Lecturers be converted to tenure-track Assistant Professor in order to maintain an adequate teaching staff to meet instructional demands in the department(see PPS 7.22). CRITERIA 2. To be eligible for conversion to Senior Lecturer, a Lecturer must have taught courses in the department for at least one academic year and established a record of highquality teaching effectiveness. 3. To be eligible for conversion to tenure-track Assistant Professor, a Senior Lecturer must have taught courses in the department for at least three years, established a record of high-quality teaching effectiveness, shown an aptitude for scholarly activity as demonstrated through publications and professional service, and provided significant services to the department and university. PROCEDURE 4. In the spring semester of the academic year, the department Chair will discuss with the tenured/tenure-track faculty and the Personnel Committee the need and/or desirability of converting faculty members to Senior Lecturer or to tenure-track Assistant Professor status for the following academic year. If the conversion of one or more than one Lecturer and/or Senior Lecturer is deemed to be in the best interests of the department and the university and if funding for the conversions is identified, the Chair will inquire of the affected individuals whether or not they wish to be considered for conversion. 5. In the case of Lecturer to Senior Lecturer, the conversion process will include a review by the Personnel Committee of the candidate s record of teaching and a meeting with the Personnel Committee. 6. In the case of Senior Lecturer to tenure-track Assistant Professor, the conversion process will include a review by the tenured/tenure-track faculty and the Personnel Committee of the candidate s teaching, scholarship, and professional service in keeping with the hiring procedure for other tenure-track faculty. 7. By the spring deadline for Personnel Committee decisions on their appointment of tenure-track faculty, the Personnel Committee, acting on the advice of the tenured/tenure-track faculty shall notify the department Chair of their decision with regard to the conversion of any Lecturers or Senior Lecturers. 13 8. In the case of Lecturers, based on the Personnel Committee s decision the department Chair shall notify candidates of their status for the following academic year. 9. In the case of Senior Lecturers, the department Chair shall inform the candidate of the Personnel Committee s decision. If that decision is to recommend conversion, the department Chair shall prepare a memorandum for the university Provost requesting the conversion of the candidate to tenure-track Assistant Professor. 15 History PPS the accomplishment took place through a bonus system. 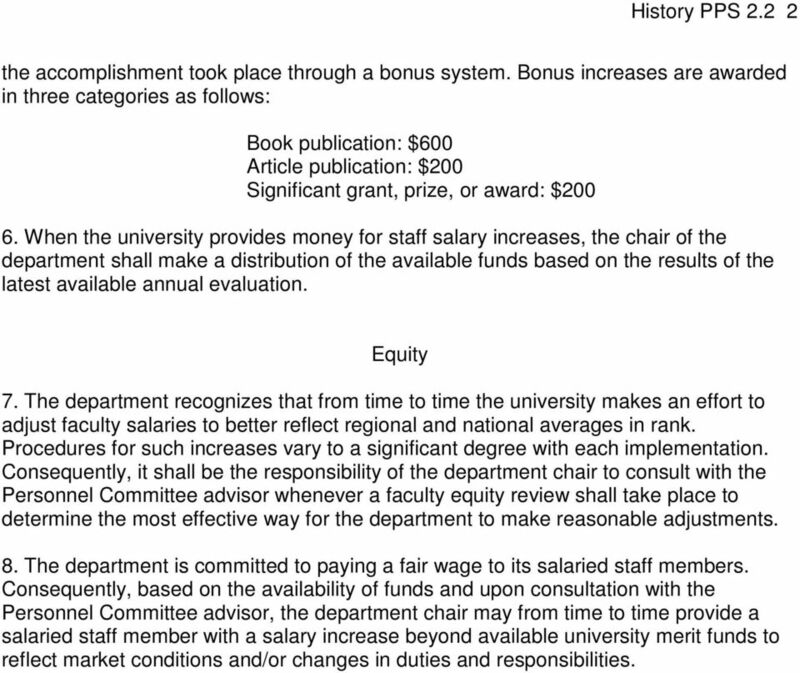 Bonus increases are awarded in three categories as follows: Book publication: $600 Article publication: $200 Significant grant, prize, or award: $ When the university provides money for staff salary increases, the chair of the department shall make a distribution of the available funds based on the results of the latest available annual evaluation. Equity 7. The department recognizes that from time to time the university makes an effort to adjust faculty salaries to better reflect regional and national averages in rank. Procedures for such increases vary to a significant degree with each implementation. Consequently, it shall be the responsibility of the department chair to consult with the Personnel Committee advisor whenever a faculty equity review shall take place to determine the most effective way for the department to make reasonable adjustments. 8. The department is committed to paying a fair wage to its salaried staff members. Consequently, based on the availability of funds and upon consultation with the Personnel Committee advisor, the department chair may from time to time provide a salaried staff member with a salary increase beyond available university merit funds to reflect market conditions and/or changes in duties and responsibilities. DEPARTMENT OF ACCOUNTANCY DEPARTMENTAL POLICY STATEMENT Mandatory First Paragraph A. It is the right, responsibility, and privilege of University faculty to participate in the governance of their departments.